Hey friends. It's been a while...ok actually about 2 weeks. I had plans to post some fun stuff last week...and then my kids decided to get me sick. I decided this would be a very appropriate time to take a break, especially since it was the Holidays and all. So basically I spent the Holidays sick. Good times. Or not. But there's always next year, right? So let's change the subject because I'm starting to feel sorry for myself...and that's never a good thing. ;) Let's talk about breakfast instead! Breakfast is really my thing. I know I've said it before, but I LOVE BREAKFAST. I don't know why, I just do. 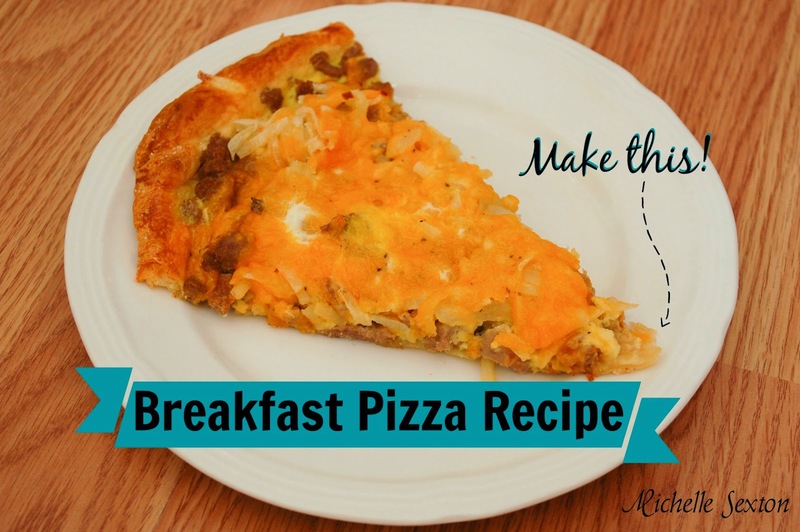 So I want to share this Breakfast Pizza Recipe that I came across on the Shrinking On A Budget Meal Plans a while back. We actually ate this for dinner, but this is totally appropriate for breakfast too. I will leave it up to you as to which meal you prefer to eat this at. Are you a breakfast fiend like I am? Yes? I also recommend Breakfast Cookies. You won't be disappointed. Preheat oven to 375 degrees. Line a cookie sheet with foil and spray with non-stick cooking spray. Separate dough into triangles. 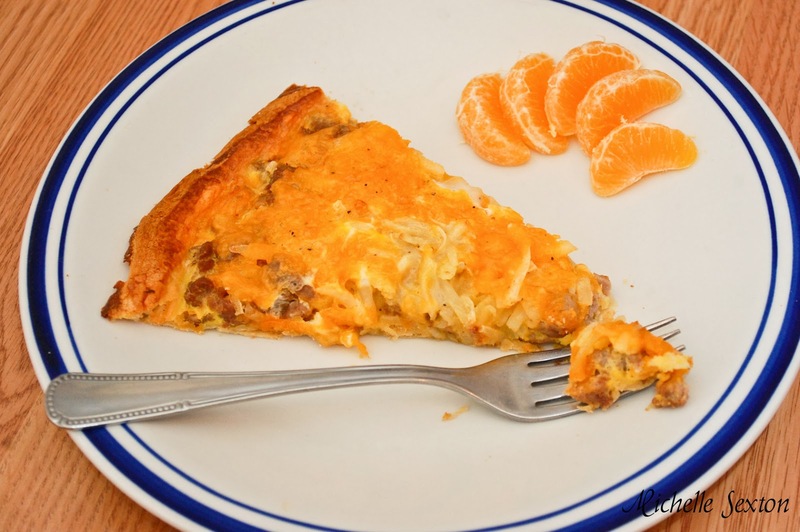 Arrange triangles to form a single round crust on a cookie sheet (arrange into circle). Press triangles together. The crescent crust will go all the way to the sides on the narrow ends of the cookie sheet. Crimp edges of dough with fingers to form a 1/2 inch - 3/4 inch high rim (this will hold in eggs). 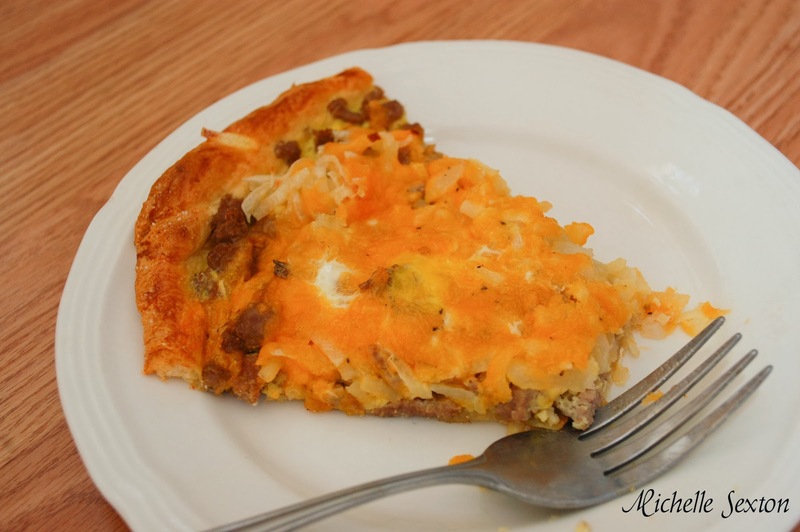 Top prepared dough with sausage, potatoes, and cheese. Combine milk, salt, pepper, and egg substitute, stirring with a whisk. Carefully pour milk mixture over sausage mixture. Bake at 375 degrees for 25 minutes or until crust is browned.